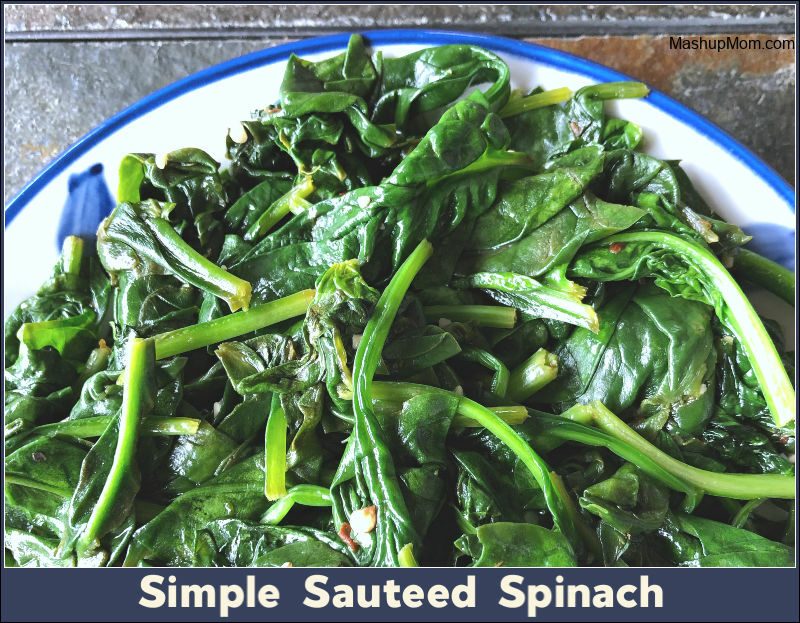 Simple Sauteed Spinach is an easy ten minute vegetarian side dish option for your busy weeknights, full of garlicky flavor and packed with vitamins! 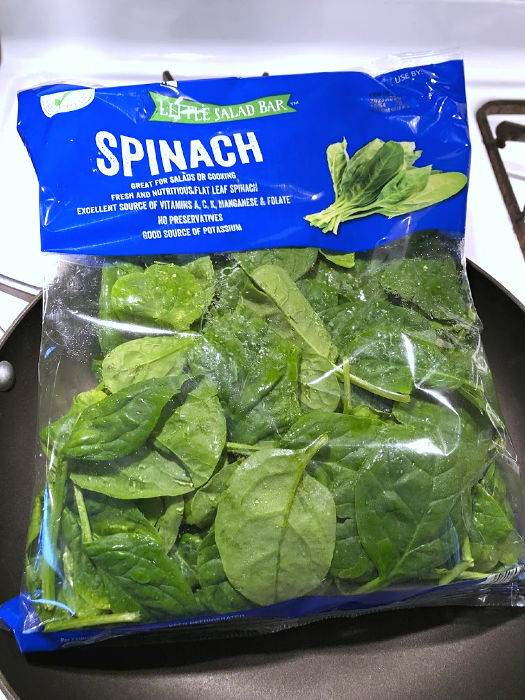 Here’s a simple side dish that I make all the time with the cheap bags of spinach from ALDI: Simple Sauteed Spinach takes less than 10 minutes to throw together, and makes a great side for so many different dinners. I usually like to keep our side dishes simple, and often just roast or saute up veggies and/or potatoes so that I can focus most of my attention on our main. This easy garlicky sauteed spinach does the trick nicely! Also try sauteed spinach over baked potatoes with a little shredded cheddar and some bacon bits, stirred into rice, or as a bed for everything from fish to pork chops. 8 oz bags of spinach run $1.19 every day at my ALDI store, but sometimes go on sale as low as $.99. So, I always keep a bag or two in the fridge and ready to throw into recipes, in salads, onto frozen pizza, or to create this quick & affordable veggie side dish on a busy weeknight. Heat 1/2 Tbsp olive oil in a large skillet over medium heat for 1-2 minutes, until shimmering. Add the minced garlic and saute briefly, then stir in the entire bag of spinach by the handful. 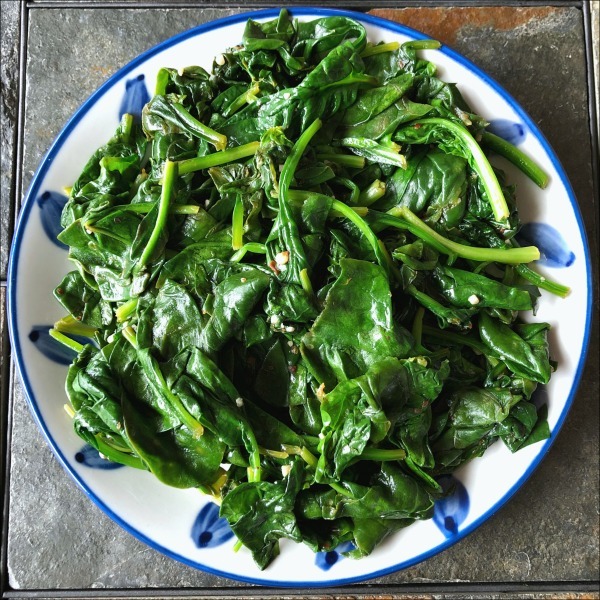 Season your spinach with 1/4 tsp crushed red pepper, sea salt, and black pepper to taste. Once it starts wilting down, stir in a splash of lemon juice. Saute over medium heat for 4-5 minutes, stirring often, until spinach is wilted and dark green (being careful not to overcook). Serve hot. Note: You can also throw in a few bacon bits for some extra smoky saltiness, if you like — although I didn’t in mine today. And that’s what I’m talking about. It’s so easy to saute this spinach up in a pan while cooking up the rest of your dinner, and it cooks down so much that the kids don’t feel like I’m making them eat a ton of veggies — yet they still get a lot of nutrients. 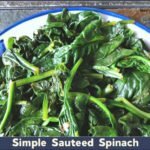 Simple sauteed spinach is naturally vegetarian (if you don’t add bacon bits, of course! ), gluten free, and dairy free, making it a great weeknight side dish option for almost any dinner. 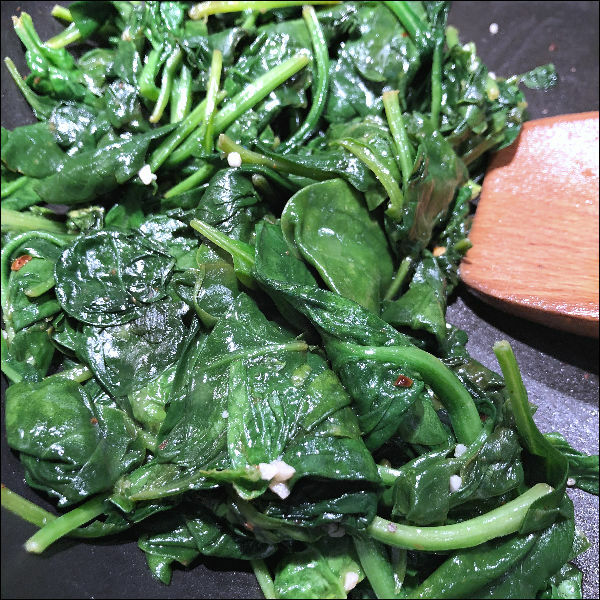 Simple Sauteed Spinach is an easy ten minute side dish option for your busy weeknights, full of garlicky flavor and packed with vitamins! Heat 1/2 Tbsp olive oil in a large skillet over medium heat for 1-2 minutes, until shimmering. Add the minced garlic and saute briefly, then stir in the entire bag of spinach by the handful. You can also throw in a few bacon bits for some extra smoky saltiness, if you like -- although I didn't in mine today. It seems that I make this at least once a week. I keep a couple bags on hand as well. I am always out of garlic so I throw in garlic powder and the splash of lemon is a great addition if you have it. Have a great week everyone and stay warm. This is such a great, simple recipe. Thanks for the reminder that this is so easy! Will try this one. About time to introduce more vegetable to the kids.